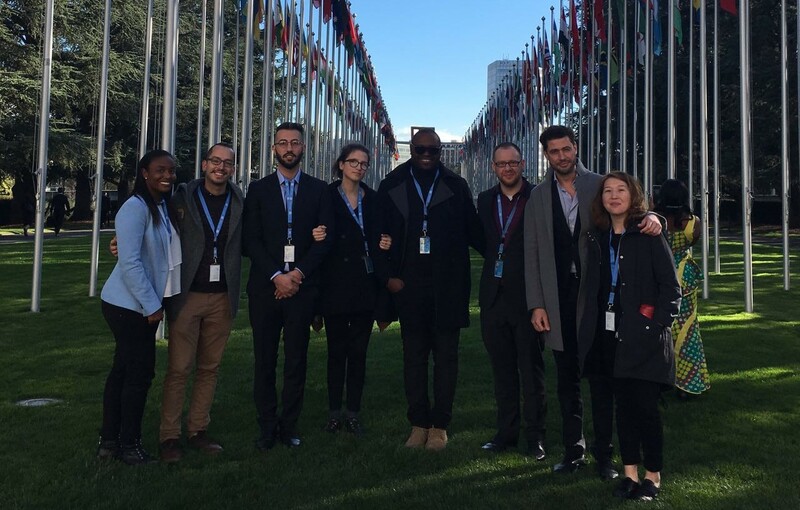 In April 2018, ILGA and COC Nederland welcomed six human rights defenders to the United Nations in Geneva, for a unique opportunity to raise awareness of SOGIESC issues in their own countries and regions at the international level. As their countries were getting ready to see their human rights record analysed by other UN member states, the defenders joined a week of advocacy around the Universal Periodic Review. Over just five days, they met with governments from every region of the world and shared snapshots of their communities’ lived realities, highlighting recommendations they would like to see made at the upcoming UPR. Before a rather intense week of work really kicked off, the defenders took part in an interactive training session: a crash-course on how to most effectively engage with diplomatic missions, highlight human rights concerns that they can best respond to, and follow-up on advocacy efforts. It was a much-needed entry to the week before they got ready to set foot into the United Nations and dive into meetings. In only five days’ time, the defenders met with representatives of more than 20 countries from across the world – sharing stories from their communities, highlighting everyday challenges, and pushing for change by proposing priority recommendations to be made. but also to have taken to heart what I talked about. Gaining strength and inspiration from each other as the week unfolded, the defenders left a tremendous mark - a mark that will eventually lead to bring about progress. “There were delegations that had never heard about the situation of LGBT people in Azerbaijan, and I was able to make them aware. ILGA supported the defenders at each stage of the UPR – from providing feedback on their submissions, to sharing advocacy tips and facilitating meetings with diplomatic missions – allowing them to overcome the barriers of a mechanism that can at times seem intimidating,and to ensure they make the most out of their advocacy to really change their countries’ human rights situation for the better..
Strategy is indeed important, as the work of the defenders is still far from over. Their countries and 7 more will be reviewed in May 2018, and ILGA is ready to follow closely what recommendations will be made. Then begins the crucial task of using them to help bring about change that matters. Our support continues throughout all this process. not to just come to Geneva to receive recommendations, but to work further back in your countries. Meanwhile, the memories of such an intense week won’t fade away easily. “This has been a truly amazing advocacy week, we had defenders from all around the world and representing all the different identities. Three times a year, the governments of the world meet at the United Nations in Geneva to review the human rights record of countries and make recommendations to them: the Universal Periodic Review, or UPR. ILGA organises “UPR Advocacy Weeks” – this time together with COC Nederland - to coincide with the crucial period in the run-up to these reviews. During these days, NGOs meet with the Geneva representatives of governments from around the world, to share the human rights situation on the ground and what recommendations they would like these countries to make to their own governments. During these advocacy weeks, the ILGA team assists human rights defenders in the preparation of oral statements and summaries to be delivered during the pre-sessions, facilitates meetings with diplomatic missions and gives advice on how to strategically conduct advocacy in Geneva and back home.